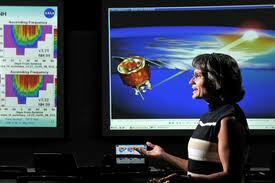 The Laboratory for Atmospheric and Space Physics (LASP) is a research institute of the Graduate School at the University of Colorado Boulder with world-class expertise in experimental, laboratory, theoretical and information systems approaches to solar research, Earth science, planetary science, and space physics. These unique abilities put the Laboratory into the top tier of University space research groups in the country and the world and allows LASP to contribute in unique ways to the University academic environment. LASP employs 327 professionals and 142 students. Grants and contracts expenditures were $73.3 M per year in FY 10-11, helping to establish CU Boulder as the top public recipient of NASA funding. 17 LASP tenure-track faculty have joint appointments in the Departments of Astrophysical and Planetary Sciences, Geological Sciences, Atmospheric and Oceanic Sciences, Physics, and Aerospace Engineering. Several of the LASP research faculty also teach classes in these same departments. A goal of the Sun-Climate Research Center is to provide unique undergraduate and graduate opportunities to attract students in science, technology, engineering, and mathematics (STEM) disciplines. The SCRC enables post-doctoral scientists and graduate students in science, engineering, and mission operations to move between LASP and Goddard Space Flight Center, thereby increasing the intellectual ties between LASP and GSFC. GSFC scientists will benefit through enhanced career opportunities including developing new curricula in Sun-Climate research, sabbatical arrangements to teach courses at CU Boulder, and improved access to graduate students. The SOlar Radiation and Climate Experiment (SORCE) project, a LASP and Goddard collaboration, actively participates in this program for current sophomore and junior undergraduate students. Since 2007, successful applicants (typically 6 per year out of the chosen 16) work on an 8-week summer research project mentored by scientists at LASP. For more information on this opportunity, visit REU program at LASP. For more information on the SORCE mission, visit SORCE at LASP.